As of today, I've been here for five years. Enjoy the last part of the trip recap. Keep in mind that this was written by Seth, so when "I" do something, it's actually him talking. Sorry for the delay in posting this, Blogger was having issues. Five years ago today (Wednesday) Seth and I loaded up my U-Haul and carted my many belongings across the country, or at least the section covered by I-90 that goes from Madison to Bellevue. I keep thinking that I'll update again, and then I look and see that a week has passed. I did pretty well last week with a couple of updates, but then nothing. And the weird thing is that it doesn't seem like that much time has passed. The last week has been good. I actually purchased some songs from iTunes (which, I think is the first or second time ever for me) that I knew I would never buy on CD. Those songs being H.W.C. by Liz Phair and Jam On It by Newcleus. The latter being one of my favorite songs from when it was released when I was 13. Oh, I had a good laugh. Over the weekend Julia and I watched Brick, Seven Up and Seven Plus Seven. Brick was good, but I had a hard time getting into it. It may be worth a second watching, but it was so dense that when I missed a couple of lines of dialogue I had to take the next ten minutes to figure out what I missed. I enjoyed it, but not nearly as much as those who recommended it to me. Seven Up and Seven Plus Seven were the first two parts (totally about an hour and a half) of an ongoing documentary series that follows a group of 16(?) English children from their seventh year and every seven years thereafter. So we got to see them at 7 and 14 in these movies. The new movie to be released later this month is 49 Up. It's amazing to think they've been following these people their entire lives and I'm really looking forward to 21 Up, which is coming from Netflix soon. If you haven't seen these, I highly recommend them. They're equal parts inspiring and heartwrenching while being wholly fascinating. On Sunday, Julia and I drove to Edmonds to meet up with her parents for dinner. They'd been out on their boat (a Nordic Tug) and wanted to do dinner, but they wouldn't be back to Seattle until the next day, hence the drive. We had a good time and ate a place called Arnie's right near where their boat was docked. I'm seriously considering buying a house, but I'll talk more about that as I get more information lined up. I started a new diet. It's a restricted-calorie diet. I've been reading some things about them and they sound really interesting. I've always said I'd like to live as long as possible and it sounds like this sort of diet could help me to do that. In addition, it'll have the side-effect of making me lose weight. Since last week I'm already down a few pounds, so I must be doing something right. Another benefit is that I'm really thinking about what I'm eating and planning out balanced meals, so I'm getting to eat anything I want and my meals are much healthier. I'm pretty committed to this one. 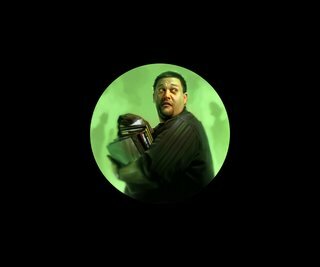 Jason posted some great things on his site lately. The first being an excellent snippet from MSNBC in response to Clinton's "outburst" on Fox News. It's ten minutes long, but definitely worth it. Watch the video here. It's nice to see someone who's done his research taking the Commander and Chief (Moron and Thief?) to task. I just wish more people would listen and be up-in-arms. The second thing was a link to gotohellboy.com. Fans of the movie and comics should find something they like there. Okay, enough for now. Time to do some work. 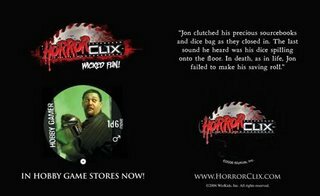 Here's what the HorroClix Victim Token looks like (front on the left, back on the right). Enjoy! I'm sure you can still get your own copy in the stores. Julia and I saw Little Miss Sunshine on Friday. It was an excellent film. Very well written with a lot of great characters. I definitely recommend it. Go see it. Saturday night I played poker at Tyler's with a bunch of his friends. I hadn't met any of them before, but they seemed like really fun, nice people. Hopefully I'll get to hang out with them again sometime. Oh, and I won $10. Woohoo! Sunday Julia and I were up early to get to the Fremont Sunday Market. She's been wanting to sell her jewelry there for a while, but this was the first weekend we could make it. The booths were pretty cool, with a nice mix of all sorts of junk, crafty stuff, furniture (a surprising amount of furniture, actually), food, jewelry, clothing, and more. Unfortunately, I think there was too much jewelry, so we're probably not going to go back to sell there. Feel like watching the first episode of Heroes? You can see it here, along with a number of other premeire episodes. I happened to watch Studio 60 last night and it was great. Check them both out if you're interested. I just received an email from a friend who'd just received his new issue of InQuest Gamer (or IQ Gamer, depending on the branding this month). And he said my HorrorClix victim token was included with this issue. Here's the image they used. The art was done by Kieran Yanner. The stuff I'm holding include a black three-ring binder, Fudge, Shadowrun 3rd Edition, Mutants & Masterminds 2nd Edition, and my old, maroon dice bag. Now run out and get your copy! Only $1.99! Cheap! I still have a lot to do around my apartment before it's in good shape, but I have all of the Fiestaware cleaned and put away now and the old dishes are ready to go to Goodwill. The next things I have to take care of are getting rid of all the boxes that have piled up. I have a few from when I moved out of WizKids and a couple more from the stuff I shipped back from GenCon. That won't take much and they certianly take up a lot of room -- and they don't look so good. I'll get that stuff taken care of soon. Most likely between taking care of assignments for the new job...it's good to take breaks every now and again. This weekend was a lot of fun. Julia and I had some time on Saturday to relax on Saturday afternoon. That's something we haven't been able to do for a while. It seems like we've been running around for one reason for another for quite some time, but Saturday she looked through some bead catalogs and took a short nap while I finished reading John Twelve Hawks' The Traveler. I definitely recommend it. It's well written and presents some very cool ideas about how a paranoid might see all of the surveillance we're under all the time. I'm looking forward to the next book in the series. Saturday night we got together with Shana, Shane, and Cathy for dinner at the Taste of India. We hadn't all been out together in a loooong time and it was good to see them. Shana's convention season is pretty much done now, so she's happy to be able to hang out again. Shane and Cathy are always busy with work, but it looks like they're in a lull right now, so they needed some downtime, too. After dinner we went back to Shane and Cathy's to play Catchphrase. Shane and I played against the girls and they kicked our butts, but did we laugh! It was a really good time. Afterward Julia said she'd never seem me laugh that much -- and that's saying something. Shane and I have talked for years of working on something together. We have a comic that we started and a film, but now we're going to get serious about it and try to get some things done. I'll let you know how it goes, but it should be pretty exciting. Sunday we met Shana, Shana's dad, Sheelin, and their friend Jamie for brunch at 13 Coins, which was quite tasty, then we went to the Seattle Center for a rock and gem show. Julia wasn't sure if there'd be any beading stuff there, but she found some very good and relatively inexpensive stuff that she was pretty excited about. The last couple of days I've been busy taking care of bills, writing up contracts, and trying to get some things for the new company taken care of. That's all going well and Jim should have some good information for me in the next couple of weeks. How cool is the new ipod shuffle? And, man, do I neeeeeeeeed one of the new 80gig ipods (that can play movies and some games)! For some reason I don't think $349 is all that much for that much fun. I'll let you know more soon. Yeah, my blah feeling was fleeting. Now I'm back at work and busy editing the first bit of the world bible. That's going well as I've read it before and made a few corrections then. I have a handful of other things to do today, too. At some point I need to check to see if a wooden printer's tray is at an antique shop in Renton, then I have to get downtown to get comics and pick up Julia. I've already written a bunch of emails this morning and called Carter to see if he can sculpt something for me. It's fun to get all this stuff going. When Julia and I were shopping on Monday we stopped at the aforementioned antique store and Julia found a green Fiestaware plate on sale for $35. Yikes, I hazard to guess how much all the stuff I brought back is worth. Not that I'd sell it, I love that stuff. It really reminds me of home and my family -- especially Mom and Grandma. It bothers me when I write Grandma. Not because it's incorrect, but it's just not the way I pronounce it. See, I say "gramma" not "grand me", it just sort of rolls off the tongue the first way, but to write that, well, it just looks so wrong. Anyway, when you see me write "grandma", read it as "gramma" and then I'll feel alright about it. Cool? Okay, time to edit and pay some bills. Whee! Some days I feel like I want to be doing something else. Not anything specific, I just want to be doing something other than what I have to do right now. It probably doesn't help that I have serious reservations about the future of the adventure gaming industry and I know in the upcoming years I'll very likely make the jump to electronic games, but that's probably a long way off. Hmm, maybe I'm just in a bad mood for some reason because what I wrote above really sounds negative. It's not supposed to be, I'm just trying to shake this feeling by getting it on "paper". I'll work on it offline and see what I can do. Thankfully I have a lunch planned with Tyler today, so that should be good. Last night I ran the first part of a new Warhammer game for the guys. They rolled everything randomly and we ended up with a Halfling Rogue, Dwarven Thief, Human Charcoal Burner, and an Elven Entertainer, which made for an unusual group. It's a good thing the canned adventure I was using forced them all together, otherwise it might have been a bit difficult to get them to form a group. Jason just got a new laptop that I'm very jealous of. I get closer and closer to getting one of my own. I think I need to sell some of my cool WizKids sets to get the money together. Anyone out there interested in complete sets of Mage Knight, MechWarrior, or almost anything else? I really want to get rid of some of it to clear out some space, but getting everything together and organizing it really sounds time-consuming and unfun. Ah, I'll get to it, I'm sure. My birthday was the beginning of August and Julia's was the beginning of September, so our month of birthday fun just came to a close this weekend. I'd picked up a couple of gifts for her while we were on our trip to Wisconsin (a new blouse and a necklace), but this weekend I found a book I thought she'd like (she did), a magazine I thought she'd want a subsciption to (she did), a new purse I picked up at the Capitol Hill block party, and some money for clothes. The money came in particularly useful because we went shopping on Monday and picked up a ton of good stuff for very little money. We didn't have any big social engagements this weekend, but Friday Kevin and Lori were in town, so we hung out with them. I picked them up in the afternoon and we checked out Pike Place Market, then we picked up Julia and joined Seth and a couple of others from work for drinks in Kirkland at the Cactus. It was a good time and I'm sorry that Kevin and Lori were only in town for the evening. Saturday night we went to see The Illusionist at the Neptune on 45th, which was very good. I love Edward Norton (and Paul Giamatti). It was a cool period piece, well-written, good (and appropriate) special effects, and a nice break from the crap normally encountered at the theatre. Check it out if it's in your area. Sunday morning we went on the Spirit of Washington dinner train for Julia's birthday. Her parents had won some tickets and the four of us along with her grandfather enjoyed a morning of too much food and too much wine. It was a very nice trip from Renton to Woodinville and back (check out a couple of new photos in the Flickr badge to the right). Now I'm getting ready to play a game tonight. I'll let you know how it goes.